Founded in 1985 and rebranded in 2014, 90Works is a nonprofit organization, formerly Families Count, with a new mission for serving families in need. Their vision is to help people move from being in-crisis and vulnerable to safe, stable and thriving. Officials at 90Works established a program with a goal of helping people who are struggling financially or otherwise. Their goal is for individuals to become self-sufficient in 90 days. 90Works coordinates housing, jobs, transportation, safety and health care, which is what Cate Jordan, Executive Director, calls the basics for survival. 90Works has a 90% success rate getting people self-sufficient in 90 days. The goal is to support everyone in our community. “Community Foundations all around our state play a vital role in supporting individuals in need of basic social services. We at CFNWF are pleased to be able to give back to our community through this grant”, said Justin Tate, Board Chairman for the foundation. Established in 1995, the Community Foundation of Northwest Florida is a nonprofit community organization created by and for the people of Northwest Florida. 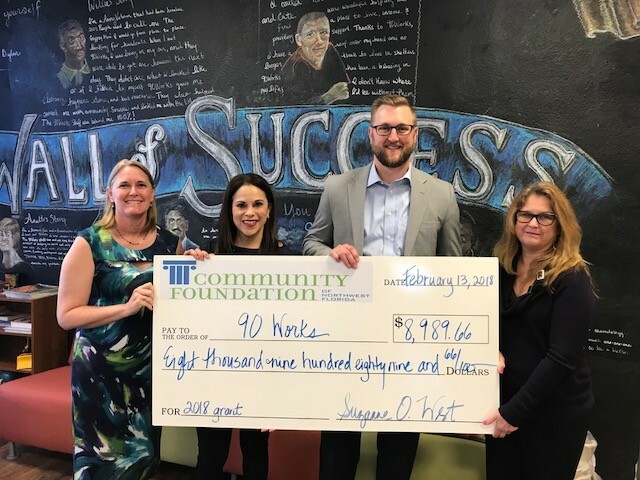 The Community Foundation helps donors establish giving funds that reflect their philanthropic interests while making a positive impact on the community. Donations to support the work of the CFNWF may be made to the Community Foundation of Northwest Florida, 17 West Cedar Street, Suite 2, Pensacola, FL 32502. The CFNWF was first established in 1995, through an initial grant from the D.W. McMillan Foundation in Brewton, Alabama. The CFNWF has accreditation in the nation’s highest standard for philanthropic excellence, the National Standards for U. S. Community Foundations. The CFNWF joins more than 700 community foundations that have received this accreditation.